Three teenagers have been arrested following the gruesome murder of a 13-year-old boy in the southern Japanese city of Kawasaki. Local media have speculated that the killing might have been inspired by recent executions carried out by the Islamist State. The victim, Ryota Uemura, was stabbed repeatedly in the neck, with some of the cuts reportedly striking as deep as the carotid artery, Japancrush reports. There were also knife wounds to his face and arms. 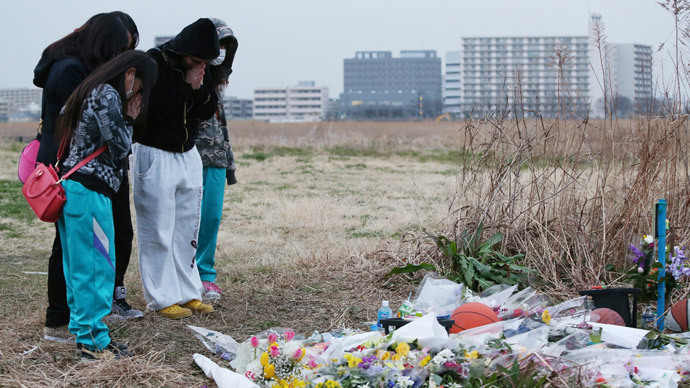 His naked body was discovered in undergrowth on the bank of the Tamagawa River last week. The blade of a cutter knife covered in the victim’s blood was found near the scene. The blade, however, does not match the shape of the wounds, pointing toward the possibility that multiple knives were used in the attack. Uemura’s body was discovered after a fire was reported around 3 am in a public toilet some 700 meters from the scene of the crime. Police suspect the perpetrators were attempting to destroy the evidence. Cut-up cable ties were also found at the scene, which were likely used to restrain the victim, who bore no defensive wounds on his palms. There is some speculation that the murderers were inspired by a series of decapitations carried out by the Islamic State (also known as ISIS, or ISIL), AFP reports, citing the popular weekly Shukan Shincho. Due to the nature of the injuries inflicted on Uemura, police said they believe the perpetrator or perpetrators may have been attempting to behead him. "Some investigators suspect [the criminals] watched Internet videos showing the execution of hostages by Islamic State fighters and sought to mimic them," AFP cited an unnamed source close to police as telling the weekly. On Friday, three boys, including an 18-year-old, were arrested by the Kanagawa Prefectural Police Department in connection with the murder. The 18-year-old, believed to be the main suspect, has denied he played any part in the killing, Japanese media reported. The suspects were arrested after police examined security video footage near the site where Uemura’s body was discovered. A group of people, potentially including Uemura, were seen in the area on the day he was killed. A friend of the victim says Uemura had told him he was being severely bullied by older students and feared he might be killed, Japan Times reported. Uemura said his attempts to distance himself from them only incited them to greater acts of violence. Japan has one of the lowest homicide rates in the world, with violent crime usually capturing the headlines. The recent murder of two Japanese citizens – war correspondent Kenji Goto and his friend Haruna Yukawa – at the hands of the Islamic State sent shockwaves through the country.